In the last two meets, the Bakersfield College swim teams had 18 top-three placers in their events. This past weekend BC swam on over to the 38th Cuesta Invitational. BC’s men swimmers took a team score of 263 points, which put them at 5th out of 23 teams. Even with a smaller roster than some of the schools at the meet, the women’s side still did well. BC women swimmers took a team score of 142 points, which put them at 10th out of 23 teams as well. Overall BC took 5th place with a total of 404.5 points. With the men’s side finishing in 5th, this was a good indication to head coach Matt Moon that they are doing well. “That’s really good, we were ahead of everyone in our conference at the meet…Ventura, Cuesta and Santa Monica,” said Moon. For the men, Edward Smith and Erik Wood seemed to lead the Renegades. Edward Smith took 2nd place in the 50-yard breaststroke with a time of 29.70 seconds. Erik Wood took two 2nd places in the meet for the 50-yard butterfly and 200 yard fly. 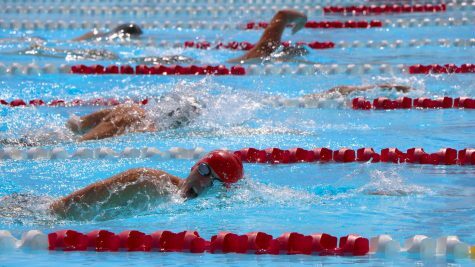 Wood finished the 50-yard butterfly with a time of 23.38 and the 200-yard butterfly at 2 minutes and 16 hundredths of a second. On the women’s side Sara Klang and Bri Smith were at the top for the Renegades. Bri Smith finish 2nd in the 50-yard breaststroke with a time of 33.35. Smith also placed in the top 4 for both the 100 and 200-yard breaststroke. Sara Klang placed 3rd in the 200-yard freestlye coming in at 2:01.69. Klang also placed 6th in the 50-yard butterfly and 7th in the 100-yard freestyle. The previous weekend of Mar. 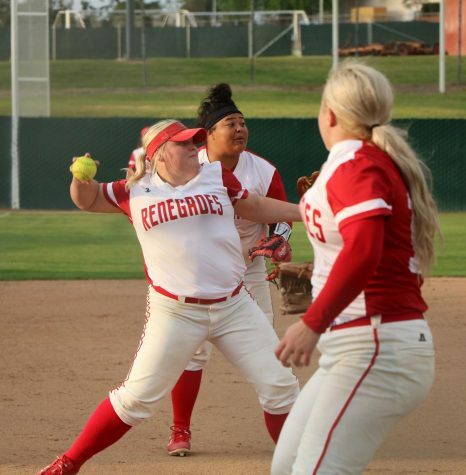 5, BC had made its way down to LA Pierce, where BC took 13 top-three placings. 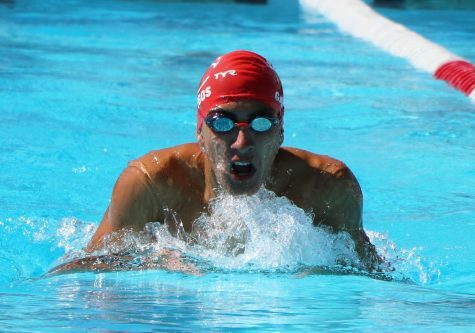 For the men, Daniel Delgadillo took 1st in the 1000-yard freestyle and took 2nd in the 500-yard freestyle events. Delgadillo reeled in the 1000-yard freestyle with a time of 11:17.40 and a time of 5:31.12 in the 500-yard free, which was around 30 seconds faster than the time of 3rd place. Right above Delgadillo in the 500-yard freestyle in 1st place was teammate Christain Chau, clocking with a time of 5:17.25. Chau also placed 2nd in the 200-yard IM with a time of 2:10.07. Aaron Green of BC took 2nd right behind Delgadillo in the 1000-yard freestyle with a time of 11:26.18, and also took 2nd in the 100-yard butterfly coming in at 1:02.10. Clocking in about three seconds behind Green in the 100-yard butterfly was Roman Somano, coming in with a time of 1:05.38 putting him in 3rd. Brian Bender placed 3rd in the 50-yard freestyle at 23.95 and 3rd in the 100-yard breaststroke coming in at 1:06.24. On the women’s side, Bri Smith and Sara Klang were sticking to the top of their events with both grabbing a 1st place, and Smith taking two. Bri Smith took 1st in both the 50-yard freestyle coming in at 27.28, and the 100-yard breaststroke with a time of 1:11.68. Klang took 1st in the 200-yard freestyle coming in at 2:05.65. Klang also fell just short of 1st and grabbed 2nd in the 500-yard freestyle with a time of 5:42.10. With these two meets over, the Bakersfield College swim team will be looking to train through spring break and get themselves ready for the conference. Moon is looking to do what he calls tapering. This will focus a bit more on the little details and mental aspects of training and not do too much volume training, so when the conference comes around their bodies can be in prime condition. “It will start getting “easier” in the pool physically, but I think mentally it’s going to be a little more challenging because they will start thinking about their races…trying to get the energy bottled up and saved for the appropriate time,” said Moon.